Barry at Starcrossed 2010. Photo via flickr user MFGcyclocross. 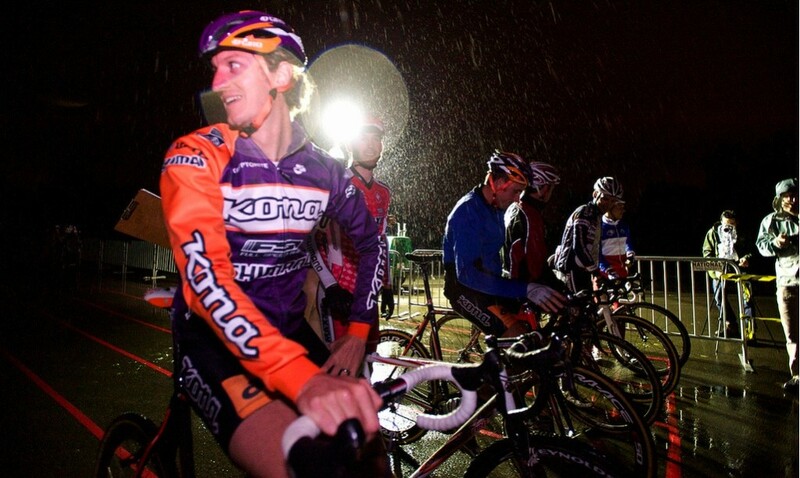 Barry Wicks is a professional mountain biker, cyclocross racer, and, as of last year, Kona’s race team manager. He cut his teeth racing in Oregon as a junior and rose to the highest levels of World Cup cross and mountain bike racing. His palmarés prove he’s a serious racer, but he remains laid back and affable through it all–a fact that’s made him one of the fan favorites in racing. I spoke to Barry while he took a break from his team manager duties, supporting his riders at Crankworx in Whistler, British Columbia. Part one of this two-part interview covered Barry’s introduction to racing as a junior, growth to his professional career, endurance mountain biking, and more. Part two picks up with Barry’s experiences racing in Mongolia, Europe, and Japan; the United State’s first cyclocross World Championship; the future of U.S. cross; and his own plans for the remainder of his racing career. You just got back from the Mongolia Bike Challenge. Tell me about that experience, both the racing and just visiting Mongolia for the first time. Mongolia was crazy. I’ve always wanted to go there because it seemed like such a different place. It was cool to travel there and get to do a bike race. Bike racing has really allowed me to see a lot of the world that I probably wouldn’t have otherwise had the opportunity to. So when I got the chance to go to Mongolia I was pretty excited and motivated to do well. The reality of it was pretty cool. Mongolia’s such a wild place, there’s not really infrastructure. So, we went there just to have the experience and have a fun adventure and the bike race was just icing on the cake. The bike race was rad and they did a really good job of it, but you’re out in the middle of Mongolia and you have no idea what’s going to happen. We had some days where there was crazy rain and it flooded the river we were supposed to be crossing and we were stranded in our campsite for two days. You just have to be ready to go with the flow with stuff like that when you’re on a big adventure. 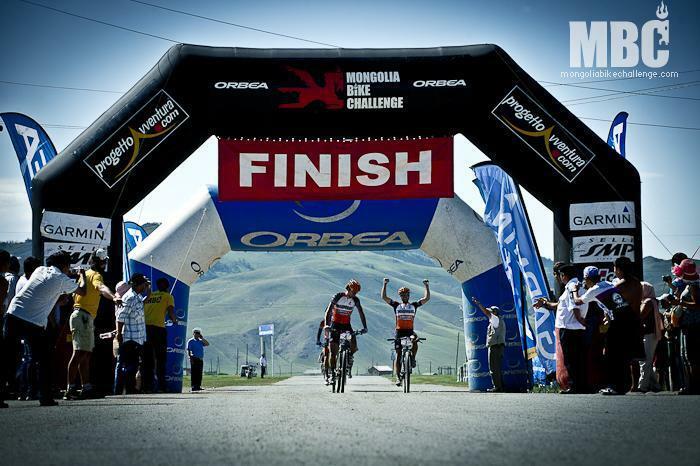 Barry, left, and Cory Wallace, right, crossing the line at Mongolia Bike Challenge. Photo via Mongolia Bike Challenge Facebook page. It seems like Kona did pretty well at the race, too. Didn’t Cory Wallace, yourself, and Kris Sneddon go one, two, three? Yeah, we did. We kind of knew we might, going in. Cory Wallace did the race last year, so our whole plan was to go over and help Cory win. It just so happened that Kris and I got to ride with Cory every day and finish with the same time as him. There were time bonuses during the race on certain climbs and we would give those to Cory. A lot of teamwork went into it, certainly. But those guys are my good friends, so it was an awesome experience just to go to Mongolia and ride with them. Do races like that, the Cape Epic or other sorts of remote, wild, mountain bike stage races bring in a lot of talent and high-level competition? I was actually really impressed with people at the Mongolia race. There were a lot of European riders. There could have been some people who were pretty unhappy and unprepared for what was happening. But everyone there was super cool and totally into and tough. It’s not easy to just be out there in the wild for ten or eleven days, but people did really well. That being said, there weren’t top-level racers there because it is such an adventure. But races like BC Bike Race and TransRockies draw some pretty top talent. Mongolia’s pretty high on the adventure scale and a little lower on the serious bike-race scale. But, it still draws a pretty good group of people. I think a lot of people are starting to catch on and put more energy into endurance racing. It gets harder and harder each year. Especially BC Bike race. Next year we’re thinking about going to Europe to do Trans Germany and races like that. There’s definitely a lot of fast dudes that do that stuff. You’ve already mentioned how bike racing has given you the chance to travel to places like Mongolia, Europe, Japan and elsewhere. Are there any trips that stand out as favorites from your career? It always seems to be the last one because that’s the one I remember the best. I just feel like every trip I’ve ever done for cycling has been a real treat. Most people don’t get to do the kind of stuff I’ve done. They don’t get to just travel around the world and ride bikes in really cool places. So I try to keep that in mind and really appreciate what I get to do. Japan was unreal. It was such a new and different place. Going to Mongolia was an incredible experience. I can’t pick one ultimate trip, but everything I’ve done with cycling has been pretty amazing. 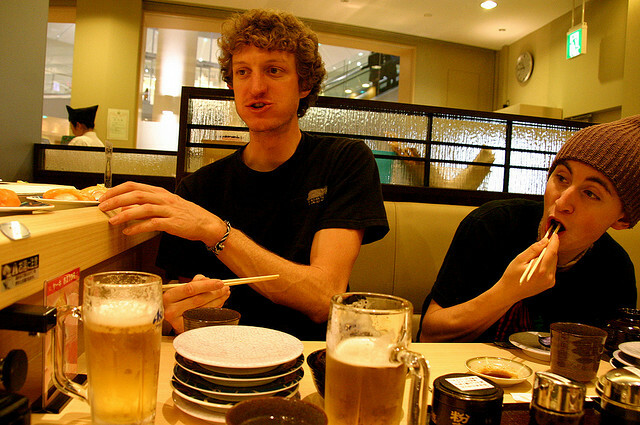 Barry and Adam McGrath in Japan for Brian Vernor’s film The Cyclocross Meeting. Photo via Flickr. Is there anywhere you have on your career bucket list that you want to race in? The whole European side of the endurance scene is really appealing to me because I think it’ll be really challenging. Those guys are so strong over there. We’ve had some of the European guys come race BC Bike Race the last few years and they struggled with the technical aspects of the race. So I think for me, the next big personal challenge is to see if I can go to those guys’ home turf and see if I can still hang with them or if they’d totally smoke me. For me that’s the next frontier, to try and break into the European endurance game–go get beat up on by the super strong Germans. What are your thoughts leading into the cyclocross World Championships in Louisville this year? Do you think it’ll live up to past worlds in terms of racing, the venue, the madness of the spectators? I think it’s cool. For the U.S. it’s a really big deal to have the world champs. Cross has become so popular in the U.S. as a participant sport and I think Louisville will be really cool and really good for it. As far as living up to world champs in Europe I don’t think there’s really a chance that’ll happen. Cycling in the United States isn’t what it is in Belgium. I’ve raced world champs in Belgium, Holland, and Germany. It’s pretty amazing the number of people who come out. I think in Louisville the show will be really good and the number of people who come out to the race will be high, but it’s still the U.S. and there’s not going to be 50,000 or 60,000 people coming. That’s just the reality of it. But that’s OK. I think it’s important for us to define that “this is what cyclocross is in the United States.” And in the U.S. it really is a participant activity. It’s awesome and all those people who participate are going to want to come watch Worlds. But I think it’s unfair to try to judge it against the European event because it’s a different sport really. Do you think having Worlds here is going to shape a lot of pros’ seasons? Are you going to base your season around Louisville? I think it’ll maybe change the way some people race. But the U.S. will get extra spots because it’s a host nation and we’ll probably have a pretty good ranking, so there will be a lot of spots for the U.S. But I think a lot of people will be gunning for those spots, maybe more so than normally would. That’ll be good, it’ll keep the events competitive and maybe get people motivated to travel and do the bigger events. Hopefully it doesn’t burn people out, though. It’s hard to qualify for worlds and go there and make an effort to actually do well. It’s one thing to just qualify for worlds. But to actually go and have aspirations to do well is a lot harder than people understand. Personally, I’m not putting any more emphasis on it than I would if the race were somewhere else. I’ll definitely try to qualify for the team. I think every year everyone tries to qualify for the team and it’s always the same guys that go. So unless someone unexpected has just an outstanding season, it’s going to be a pretty typical selection. A different type of World Championship. 2007 Single Speed Cyclocross World Championships. Photo by Carson Blume. You’ve been racing for a long time and now you’re a team manager, what do you think about the current crop of cross racers coming up underneath you? Do you think this current generation is going to be able to be competitive against the Europeans on the World Cup level? I think to a certain point, yes. We’ve seen guys like Danny Summerhill and Zach McDonald have pretty good success already on the international circuit. But it’s hard. I think a lot of the talent in the sport these days gets poached by the road. That’s where the money is as far as development and everything else. We used to have a lot of the talented athletes doing cross. In my generation–with me, Ryan Trebon, Adam Craig, and even Jeremy Powers probably falls into that–we all were supported and wanted to race cross. But now a days, that’s mostly not the case. There are some really good programs out there that still do a really good job of mentoring juniors and bringing them up in cross. But realistically, a lot of the top end guys who would be really competitive end up going to the road. Even European guys end up going to the road. It’s great for cycling, but it’s hard for cross. Do you think the money will ever come to provide the support for U.S. cross? I think from a money and support standpoint, road’s always going to be number one. But we’ve already seen huge growth in the cross market in the U.S. as far as youth programs and such. And there’s always going to be those core dedicated people who are really behind cross. Jim Brown at Rad Racing has been doing the junior cross thing for years and he’s been developing awesome riders who have gone on to do amazing things. There are always going to be those programs out there that are really good. But as far as a huge explosion or new era of American cross, I don’t know. It’s hard to say. I’d like to see that. But from everything I know and everything that’s already happening, it all gets funneled into the road side of things. Do you still have some big career goals that you’re aiming for? What’s next for you? At this point, I’m 30 years old, I’ve been racing my bike for quite a long time. For me now, taking over as team manager and everything else, my goals are to keep racing bikes and aim for a few goals on the endurance side of things. It’d be nice to try to win another national title or two in cross or mountain biking on the marathon XC side of things. But I’m also starting look now at how I can help my riders and other younger riders get to where I have been. This entry was posted in Cyclocross, Interviews, Mountain Biking, Racing and tagged barry wicks, cyclocross world championships, cylcocross, japanese cyclocross, kona bikes, louisville cyclocross world championships, mongolia bike challenge, mountain biking. Bookmark the permalink.